Does not include shoes, Please note zip finishes at belt. Company party, loads commentated on it being something different, extremely well made, our party was in a field with a bad thunderstorm, i came home covered in mud and wet through it washed like a dream, talk of the party. This item is very good quality for the price - and has loads of fantastic detail! Also, it is a little on the small side. 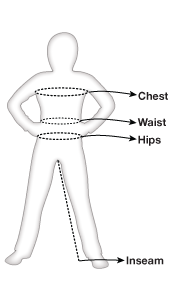 The size guide says Waist 86-96 cm / Chest 106-116cm. I have a 92cm waist and a 111cm chest and it is a little snug - it's OK, but I wouldn't recommend it if you are any larger! Best customer service I've ever received from an online store. Overall a great outfit and people actually thought i worked for NASA, only downside to this is when you need to pee you need to take the whole thing off.